A "huge move" in the search engine landscape! 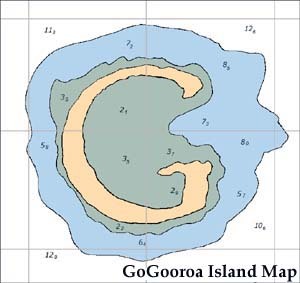 - The island is shaped like the letter "G", strongly ressembling the first letter of the Google name and corporate logo (refer to the attached map). - It is geographical owner of the ".go" domain, which is coveted by many web site editors around the world. 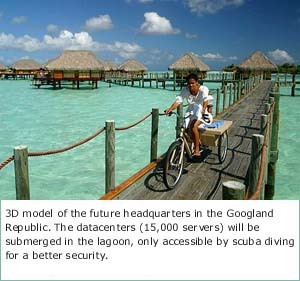 The search engine company, which is currently headquartered in Mountain View (California), is looking forward to this new site in the Pacific Ocean, on this island which will be officially renamed Googland in a few weeks. Its search engine homepage will be also be moved to the "google.go" domain name in the near future. 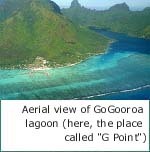 GoGooroa island is a very pleasant place to live and the Googlers (people who work at Google) will appreciate many of the advantages of living in such a paradise. For example, the Googlers won't pay any tax as the islanders will live off the money earned by Google, as an autarkic society. Every Googler will be required to have a tropical fish on his desk and an aquarium in his office. A minimum of 20% fishing time will be expected of every employee during the working day (a "Top 100" of the most beautiful fishes caught will be updated in real time). Cuisine, in Googland, is expected to be primarily fish-based. Fish is high in phosphorus and Omega 3 acids which are both important to brain health and for improved thought process, an advantage Google intends to leverage to beat its competitors in the ongoing search engine war. The chef, former "Beach Boys" rock band cook, will also have the task to initiate the Googlers in the regional tropical dances (he has already added the "The Googland Dance" to his repertoire). However, not everything is allowed. In fact, every employee out on their daily fishing expedition caught shooting out "Yahoooooo!" afeter netting a spectular specimen will be punished by having to, for a whole week, answer the complaint e-mails from webmasters unhappy with their current rankings on the search engine. Dr. Eric E. Schmidt, Google CEO, will soon be named "Googland Republic President". Sergey Brin and Larry Page, Google co-founders, will both be prime ministers, respectively in charge of external commerce and technology. A report that Bill Gates could be named "Minister of research, development and competition" was leaked to the press, but he recently denied the project, commenting that "Anyway, I don't like swimming, I prefer the mountains..."
Sources close to the search engine recently revealed that Google might be searching for five other islands, in the shapes of the "O", "O", "G", "L" and "E" letters, in other seas and oceans, with the ultimate goal to create a worldwide network of datacenters to show its supremacy on all five continents. Eric W.Foolsday, Google spokesperson, did not comment on or confim this. 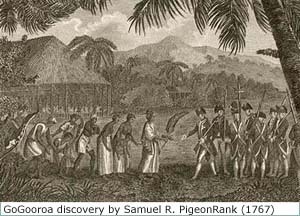 M. David C. BigFish has been named the steward of the island. David is well known by Abondance web site readers, because he works with us for a few years. He went on record: "It's a dream job, I was living in California and I love fishing. The fish are my speciality. I'm not a fool, I'm going to take this job! I'm feeling lucky..."